Ministry Of Interior has decided to issue Kuwait On Arrival Visa for GCC Residents (Saudi Arabia, UAE, Bahrain, Kuwait and Oman) with certain professions (mentioned below). GCC Residents will get on arrival form to fill at Kuwait International Airport. Valid Resident Identity should provide at Kuwait Airport. 1. Valid passport with a minimum validity of 6 months from the date of arrival in Kuwait. 2. Valid Iqama or residence permit of GCC states with a minimum validity of 6 months from the date of arrival in Kuwait. 3. Passengers must hold a return ticket. 4. GCC residence permit holder or Saudi Iqama holders should get and fill on arrival visa form from Maraheb Services at Kuwait Airport. 5. 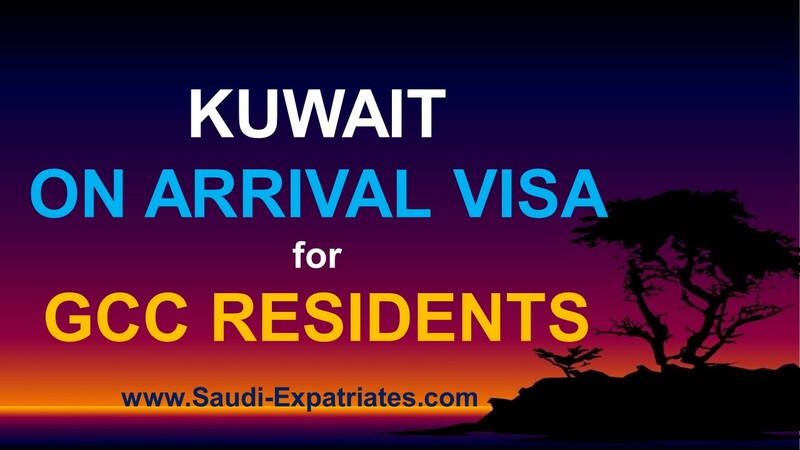 Residence address in kuwait must be register while applying for visa at airport visa counter. 6. Blacklisted passengers in State of Kuwait are not allowed. 7. Validity of on arrival visa is 3 months from the date of issue, Stay period is 1 month from the date of entry. 8. Visa Fee : 3 KD, Overstay fine : 10 KD per day. 9. Eligible GCC states (Bahrain, Qatar, Oman, Saudi Arabia, UAE) Professions for Kuwait on arrival visa. 10. Beside GCC states, 35 more countries will get on arrival visa from Kuwait International Airport. Andorra, Australia, Austria, Belgium, Brunei, Canada, China, Denmark, Finland, France, Germany, Greece, Hong Kong, Iceland, Ireland, Italy, Japan, Liechtenstein, Luxembourg, Malaysia, Monaco, Netherlands, New Zealand, Norway, Poland, Portugal, San Marino, Singapore, South Korea, Spain, Sweden, Switzerland, UK, USA, Vatican.